After 15 years of study, a bold plan for solving the Mt Baker Town Center mess was unveiled by the Seattle Department of Transportation at the March 26 open house. See Accessible Mount Baker. The well attended event included members from throughout the surrounding community, and discussed SDOT’s recommended proposals for improving modes of travel within the Town Center area surrounding the Mt. Baker light link and bus stations. During the public participation phase the SDOT team received praise and support for its work. There were also serious questions about an apparent lack of funding to get the key improvements implemented in the near future. 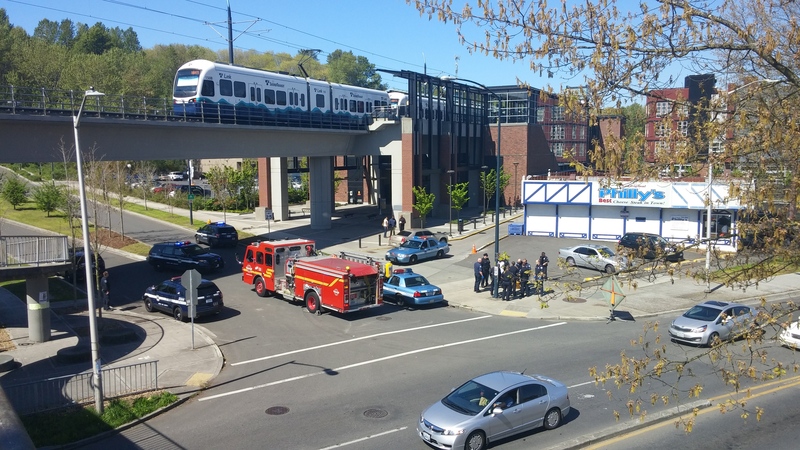 The dangerous area is frequently traversed by students and a growing number of residents and business owners, including those in the Mt Baker Lofts Artspace facility, some of whom spoke that night. Questions were also raised about Sound Transits ongoing delays in converting surplus properties from fenced off eye sores into useful areas to compliment and support the positive development that was called for in the infrastructure blighted area of the 2014 rezone. Currently, the area is recognized as an automobile dominated and unfriendly streetscape that is dangerous to pedestrians, including the many students and transit users who try to use it on a daily basis. 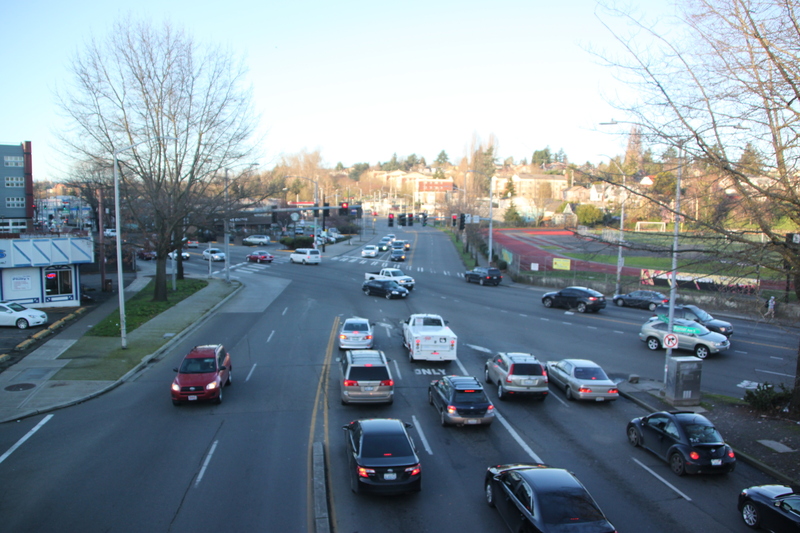 Near the intersection of Rainier and Martin Luther King Jr. Way, there are more than 10 lanes of traffic to be crossed, just to move east and west within the rezone area. The Accessible Mount Baker study is designed to conclude years of careful study, and to propose a sound solution that will best serve all modes of travel into the future. Consistent with the North Rainier Neighborhood Plan, SDOT’s mission is to transform the Town Center core from “an auto-oriented area to a transit-oriented destination”. 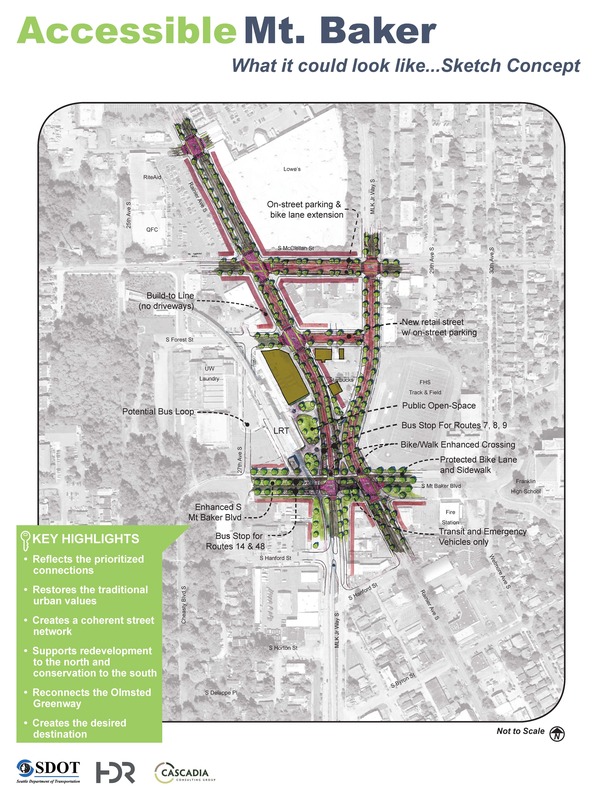 Among solutions, SDOT is exploring options for reconnecting the Olmsted Boulevards, which will be necessary to help connect neighboring communities (including Beacon Hill and Mount Baker) with a new mixed zone center. This reconnection will not only make the area more attractive to residential life and business development, it will also benefit the surrounding communities with an attractive walking and bike route from Lake Washington, through Mt. Baker to the Town Center, Beacon Hill, Jefferson Park and Chief Sealth Trail. SDOT’s new proposal was well received as an exciting plan for badly needed investment in an area that was recently rezoned to allow mixed use towers up to 125′ high. See http://www.seattlebikeblog.com/2015/04/01/mt-baker-intersection-redesign-could-revolutionize-transportation-in-south-seattle/ and http://seattletransitblog.com/2015/03/31/a-belated-but-welcome-proposal-to-fix-the-mount-baker-mess/ The City Office of Economic Development is also stepping up with a stakeholder process. It is hoped that this process will bring the type of positive focus around the compromised station area that the City has recently bestowed upon First Hill, where a well funded public realm improvement plan was has been developed. The dense growth needed for a vibrant Town Center cannot be properly accommodated or managed without prompt redesign to preserve and fulfill the promise of a vibrant Town Center. FMBTC will continue to advocate for positive change to fulfill the vision and promise of the North Rainier Neighborhood Plan — a plan is worth little unless there is the funding to implement it and preserve the opportunities for the area to support the transit oriented development that was intended under the City’s comprehensive plan. Those living and working in the rezone cannot afford to wait. Neither can the many children and others who regularly attempt to cross the 10 plus lanes of traffic to simply get from the east to west within the heart of the new neighborhood. Accessible Mt. Baker will identify near-term access and safety improvements for the community near the Link light rail station and the intersection of Martin Luther King Jr. Way and Rainer Ave. The effort will also develop a long-term multimodal plan consistent with the objectives of the Mt Baker Urban Design Framework and the North Rainier Neighborhood Plan. The process will engage community members and transit users in coming up with innovative solutions for enhancing the transportation environment for all, regardless of how they travel to and through the area.